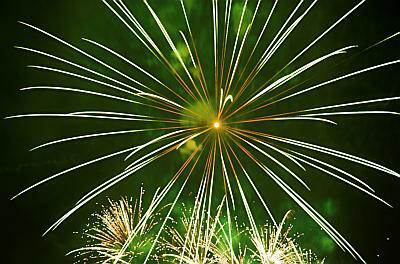 Independence day is coming up in the USA (July 4th) and you’re bound to see a lot of articles start popping up about how to shoot fireworks. So many, in fact, that you might start to think it’s some kind of dark art (Ha! Dark, get it?). It’s pretty simple though, especially if you have a digital camera with a working LCD. To shoot fireworks, and get those classic, bright, colorful lines, you just need one tool (in addition to your camera, of course): a sturdy tripod. This is essential equipment for shooting in the dark. You’ll only get photos of shaky, wavy lines without a stable platform for you camera. You’ll probably also want a medium to wide angle lens. It’ll help you cover more sky and fireworks bursts can be too big to capture with a telephoto. The classic fireworks shot shows bright lines radiating from a central point, sparks falling from the sky, and strong, vibrant colors. Focusing is easy since they’ll probably be far enough away that you can just focus at or near infinity and forget about it. Autofocus probably won’t be of any use to you and may actually interfere with your shots so I suggest just turning it off. You may be tempted to use a high ISO setting because it’s dark. You actually want to use a nice, slow, low ISO setting (200 or 100 are fine) so that you can use longer shutter speeds with less digital noise/grain. So, what’s left? 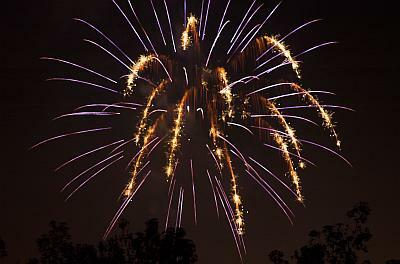 When shooting moving lights in the dark (fireworks) you need to remember two things: the shutter speed will determine how long the fireworks trails are. Longer shutter speeds make longer trails. And the aperture will determine the exposure of the trails. A wider aperture (smaller f-number) will make brighter trails and a smaller aperture will make darker trails. That’s because a wide aperture lets in more light than a small aperture. Since fireworks are intensely bright you’ll want to start with a smallish aperture of around f/8. A side benefit is that that will widen your depth of field so your focus doesn’t need to be perfect. How long of a shutter speed should you use? It depends, but shorter than you think probably. About two seconds can capture a full burst from a single explosion. Some fireworks are preceded by bright fiery rockets that you might want to capture. For those, 6-10 seconds might be called for. You’ll need to be flexible, anticipate when and where the fireworks are going to pop, and adjust your aiming and shutter speed appropriately. After you get a few shots, review what you’re capturing and adjust your settings to compensate. Want shorter trails? Shorten the shutter speed. Are the fireworks trails overexposed (turning white and losing their color)? Close down the aperture a little (f/11, f/16, and so on) until they are vibrant and saturated. Use ISO 200 or 100, start at f/8 and go smaller if necessary (f/11, f/16), exposures can be as short as 2 seconds. If your camera has a B or Bulb setting you might find that easier to use than presetting a shutter speed. In Bulb mode, the camera keeps the shutter open as long as you hold the release down. That lets you just open the shutter when you see sparks and close it when they fade. Use a remote or cable release or be extremely careful when pressing the shutter release on the camera. A little bit of camera shake can ruin an otherwise perfect shot. You can use a flash to include foreground subjects in the photo. The flash will only illuminate the foreground and will have no effect on the fireworks. Including people enjoying the fireworks or an interesting object like a national monument, flag, or statue is a nice touch. Bring extra memory cards and shoot a lot of photographs. Fireworks are very dynamic and you won’t have a lot of time to make sure you’re getting good compositions.